A bodyguard who is also referred to as a close protection officer refers to a kind of government agent or security operative who is in charge in providing protection to a single person or more than one person usually public, politically important or wealthy individuals against all forms of danger including assault, homicide, threats, harassment, kidnapping, loss of confidential information, theft and any other criminal offense. A lot of important public figures including governors and heads of state are usually protected by a lot of bodyguards that usually come from police forces, security forces or from an agency. There are instances when bodyguards are misunderstood by different individuals and the general public. The reason behind this is that thousands of individuals are often exposed to the roles played by bodyguards in highly dramatized action films. It should be noted that in comparison to the somewhat exciting lifestyle which the film screens depict, the major roles played by an actual bodyguard is often considered as more mundane. Among the roles and responsibilities played by an actual bodyguard are planning routes, gathering information about the background of those who contact his client, pre-searching the buildings and rooms where his clients will visit, searching and investigating vehicles and escorting his clients during their daily activities. It is also important for you to note that the roles played by a bodyguard will be dependent on various factors. These factors include his role within the close protection team which he is a part of and the level of risk faced by his clients. 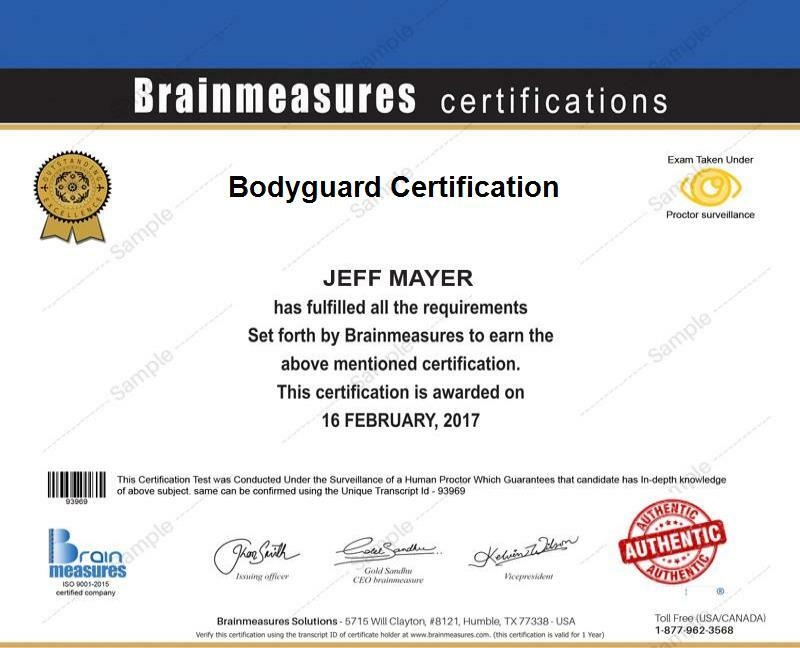 Gathering information about the scope of work of bodyguard is now easier with the presence of the bodyguard certification course from Brainmeasures. The bodyguard course which you can now access at Brainmeasures is a huge help in your attempt to generate a more complete understanding about your duties and responsibilities as a bodyguard. With the help of this online certification course, you will get the chance to access a bodyguard training which is sure to help you increase your knowledge and improve your skills when it comes to guarding anyone especially important figures in society, understand your duties and responsibilities and how you can effectively fulfil them, assess the level of security risks faced by your clients, provide your clients with the highest level of protection and obtain a more comprehensive understanding about your scope of work. As soon as you receive your bodyguard certificate, you will have greater chances of acquiring more clients who will be in great need of your services. How to effectively plan protective effort? How to effectively search premises? The bodyguard certification program which is now easily accessible at Brainmeasures is proven to be really comprehensive so you have a hundred percent guarantee that it can provide you with the most accurate and updated information about the specific techniques that you can use in effectively performing your functions as a bodyguard. You can expect this to work suitably for all aspiring and present bodyguards who want to make sure that their clients obtain the highest level of satisfaction from their services through their ability to provide them with the highest level of protection. Getting a bodyguard certification is also a huge help in your attempt to earn higher in the bodyguard industry. As a bodyguard certification holder, you will get the chance to work as a certified bodyguard which allows you to earn a salary which is mainly dependent upon the specific clients that you are working for, your experience and location and the level of risks or threats associated to protecting your clients. Normally, bodyguards earn around $55,000 to $180,000 per year.